Homemade Scotch eggs are a world away from shop bought versions. They're worth the effort for a special picnic treat. Place the eggs, still in their shells, in a pan of cold salted water. Place over a high heat and bring to the boil, then reduce the heat to simmer for exactly nine minutes. Drain and cool the eggs under cold running water, then peel. Mix the sausage meat with the thyme, parsley and spring onion in a bowl and season well with salt and freshly ground black pepper (Simon recommends being generous with the freshly ground black pepper). Divide the sausage meat mixture into four and flatten each out on a clean surface into ovals about 12.5cm/5in long and 7.5cm/3in at its widest point. Place the seasoned flour onto a plate, then dredge each boiled egg in the flour. Place each onto a sausage meat oval, then wrap the sausage meat around each egg. Make sure the coating is smooth and completely covers each egg. Dip each sausage meat-coated egg in the beaten egg, rolling to coat completely, then dip and roll into the breadcrumbs to completely cover. 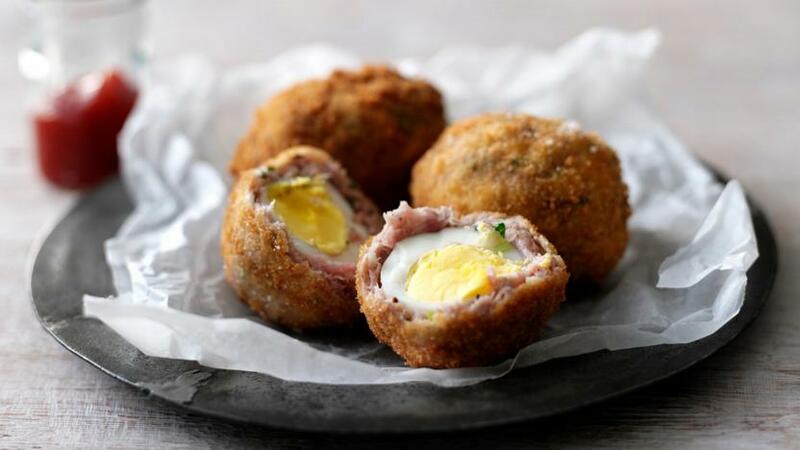 Carefully place each scotch egg into the hot oil and deep-fry for 8-10 minutes, until golden and crisp and the sausage meat is completely cooked. 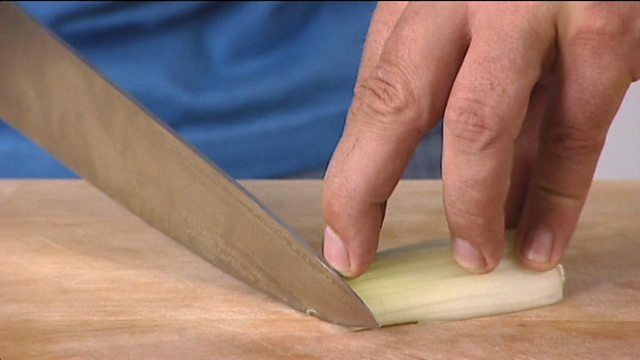 Carefully remove from the oil with a slotted spoon and drain on kitchen paper.